PT. Depriwangga Engineering has experience to provide Fuel Gas Conditioning System. Natural Gas Conditioning Systems are desig ned for the treatment of combustion turbine and engine fuel gas, as well as processing and treating of wellhead gas prior to transmission & distribution. In these applications, filtration, Heating and conditioning of natural gas is required for the performance of the turbine/engine, as well as for meeting stringent pipeline specifications for transmission of the treated gas to market. liquid) to the outlet dew point temperature which will contain a specified amount of water. Absorption of water vapor in the TEG is the common method. The wet gas is brought into contact with dry glycol in an absorber. Water vapor is absorbed in the glycol and consequently, its dew point reduces. The wet rich glycol then flows from the absorber to a regeneration system in which the entrained gas is separated and fractionated in a column and reboiler. The heating allows boiling off the absorbed water vapor and the water dry lean glycol is cooled (via heat exchange) and pumped back to the absorb. PT. Depriwangga Engineering know very well about this unit for remove sulfur or Carbon dioxide. Sulfur is present in natural gas principally as hydrogen sulfide (H2S) and, in other fossil fuels, as sulfur-containing compounds which are converted to hydrogen sulfide during processing. The H2S, together with some or all of any carbon dioxide (CO2) present, is removed from the natural gas or refinery gas by means of one of the gas treating processes. The resulting H2S-containing acid gas stream is flared, incinerated, or fed to a sulfur recovery unit. 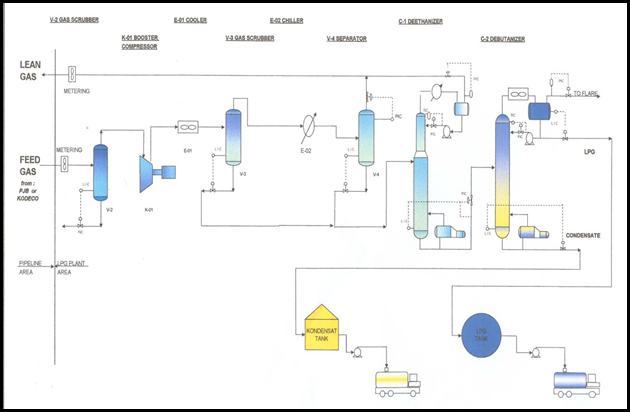 This section is concerned with recovery of sulfur by means of the modified Claus and Claus tail gas clean-up processes. Amine is one of candidate solvents that can be used for CO2 recovery from the flue gas by conventional chemical absorption/desorption process. In this work, we analyzed the impact of different amine absorbents and their concentrations, the absorber and stripper column heights and the operating conditions on the cost of CO2 recovery plant for post-combustion CO2 removal. PT. Depriwangga Engineering has experience to provide Desalter Package System. Desalter is a process unit in an oil refinery that removes salt from the crude oil. The salt is dissolved in the water in the crude oil, not in the crude oil itself. The desalting is usually the first process in crude oil refining. The salt content after the desalter is usually measured in PTB – pounds of salt per thousand barrels of crude oil. Another specification is Basic sediment and water. The term desalter may also refer to a water desalination facility used to treat brackish water from agricultural runoff. This may be done either to produce potable water for human or animal consumption, or to reduce the salinity of river water prior to its crossing an international border, usually to comply with the terms of a treaty. Desalters are also used to treat groundwater reservoirs in areas impacted by cattle feedlots and dairies. PT. 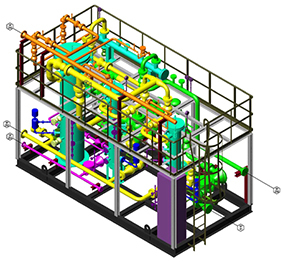 Depriwangga Engineering has experience to provide LNG Design. The design of a Liquefied Natural Gas (LNG) process is based on one of several commercially licensed refrigeration cycles. Although the choice of a refrigeration cycle and that of a turbomachinery configuration are dependent on the overall plant design, a compression system remains the fundamental constituent of any world scale LNG plant. These compression systems are typically comprised of large, complex turbomachines. Therefore, integrated control of turbomachines is of utmost importance for safe, efficient, and reliable operation.